A lawn roller can be a useful tool if you are seeding or laying sod for a new lawn. The following article will cover how to use one for this purpose as well as types of lawn rollers and where you can get them. Test your soil for the proper pH of 6 to 7.5. Remove all debris, like rocks and branches, from your intended lawn area. Use a tiller to break up clumps of compacted soil. This is a good time to add any soil amendments and a good starter fertilizer to be sure your soil will give your seeds the best start. Level your soil with a rake and remove any additional debris brought to the surface from tilling. Fill your lawn roller with water and roll the soil so it is completely level. Level ground is important for proper drainage. With a seed spreader, evenly scatter your grass seed over the newly prepared soil. Once again, smooth the soil with your lawn roller. This time there should be no water in the roller. Give your new seeds a drink and keep them moist so that they can germinate. If you like instant gratification you will want to use sod to start your new lawn. Follow the first five steps above. Then, after you have made sure that your soil is level, you are ready to lay your sod. Roll out your sod in strips. You may need additional strips or part of a strip to complete your row. Be sure the edges are firmly pressed together so you won't have a gap in your lawn. For each new row you will want to stagger your strip edges (like when you lay bricks) so the seams don't all line up. Next, use your lawn roller to go over the newly laid sod. Doing this will remove any air pockets and will help the roots of the grass to be in full contact with the soil. 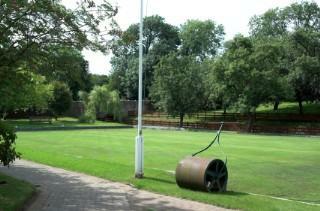 Rolling is an important step; if the roots are not in the soil your new lawn may have dead spots. Water your beautiful new lawn regularly and often for best results. Lawn rollers come in different sizes and are usually made of steel or polyethylene. They can weigh several hundred pounds when filled so be sure that you exercise caution when you use it. Some rollers are made to tow behind your garden tractor. If you have a large area to roll, this is a great option. It is also possible to rent a lawn roller. If you will only be using a lawn roller one time, this option is your best bet. 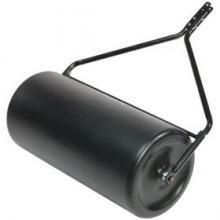 Sears has rollers available to purchase online or you can pick it up at the store. Prices are from $124.99 to $159.99. Northern Tool has several options to choose from. Prices range from $99.99 to $224.99. Amazon has a wide selection of rollers for you to browse. Do It Best.com claims to be the world's largest hardware store. They have 4100 member stores so you are likely to find one near you when you are ready to make your purchase. Use their Store Locator tool to find a retailer near you.